The word “gel” lends itself to confusion ­because it originally described the nail product’s physical state, but over the years it has become a generic name of the product category. Whereas liquid-and-powder nails are a two-part system in which the powder has already been polymerized to its full ­extent, gel is a homogenous product in which the monomers and oligomers (strings of monomers) stay in a semi-liquid/semi-solid state because it hasn’t polymerized. Think of gel as premixed acrylic. Gel nails first appeared in the U.S. in the early 1980s, but were met with limited success. At the time, the manufacturers of gel lights and the gel itself had not joined forces, not yet recognizing the need to precisely match the intensity of the light to the photoinitiators in the gel. Nail techs and clients soon found out that ­using the wrong light or applying too much gel caused a burning sensation on the client’s fingertips. ­Additionally, education on gel application was limited, leaving nail techs in the dark about the product, and home-use ­systems were introduced around the same time, damaging the reputation of salon-use systems by ­association. By the end of the ‘80s, many companies had pulled their gel products from the market. But by the end of the ‘90s, gel nails were back on the U.S. nail scene, now with much-improved formulas that were ­designed to work with a precise light wavelength and intensity. These new formulations also delivered better clarity and ­durability. Additional innovations in gels appeared in the 2000s, ­including 3-D gels, soak-off gels, and polish-gel hybrids (see “Innovations in Gels” below). By 2017, 86% of salons offered gel-polish and 55% offered gel extension services to their clients, according to NAILS 2017-2018 Big Book. Hybrid brush-on gel polishes are the trendiest innovation in the nail industry in recent memory. Hybrids incorporate the same types of solvents as nail polish, which allows them to soak off faster than the current group of soak-off gels in potted jars, plus the hybrids have other ingredients to lower the viscosity so that application is more similar to that of a polish, explains industry scientist Doug Schoon. Brush-on gel polishes pull ingredients from both polish and gel formulas, making them true hybrids. 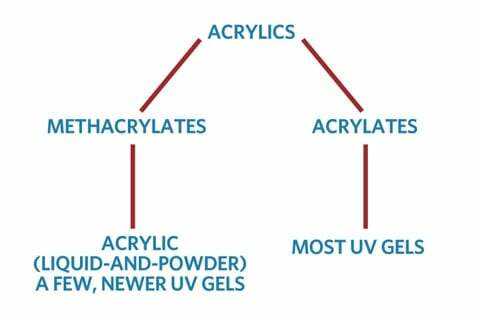 Regarding traditional gels versus soak-off potted gels, McConnell explains that traditional gels are more cross-linked, which gives them more resistance to acetone. Soak-off gels have been altered so they can be attacked by acetone. GELS: pre-mixed semi-solid monomers and oligomers that are hardened to polymers when exposed to UV-A light. Energy curable resins: a semisolid oligomer with at least one acrylic functional group that cures via light energy. Photoinitiators: ingredients that absorb light and convert it into the energy needed to drive the polymerization process. Stabilizers: chemicals that are added to prevent discoloration. Inhibitors: ingredients that prevent the gel from prematurely hardening or pre-polymerizing while still in its original container. Pigments (optional): insoluble, finely ground substances that impart color. Certain pigments (like white pigments) reflect some of the light that is used to cure the gels, while others (like black pigments) absorb some of UV light, and some just don’t cure well at all (many pigments fall under this category). 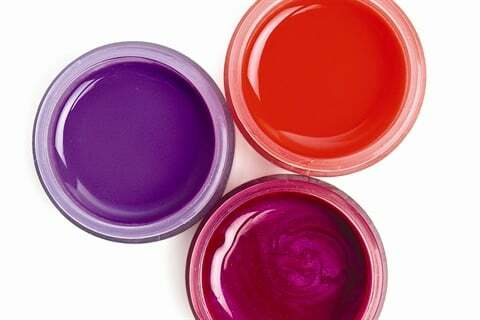 It takes significant research to determine which pigments should be used for UV nail gel. Non-energy curable resins (optional): functional fillers added to modify the properties of the gel, such as thickening or toughening the product. Solvents (optional): substances in which other substances are dissolved. Brush-on gel polishes tend to incorporate an increased amount of solvents to help them break down faster than traditional soak-offs. GEL Nail Lights: a light, generally containing multiple bulbs, that emits light in the correct spectrum to activate the photoinitiator in the gel. Most gels contain photoinitiators that react in light wavelengths of 340 to 380 nanometers (nm.). Lamp (bulb) intensity: intensity refers to how much light is available for curing. Some people mistakenly think wattage is synonymous with intensity but it’s not — wattage is irrelevant to the science behind gels and simply refers to how much electricity the bulb uses. Number of lamps: gel lights generally house from one to five lamps; three or four lamps is most common. There can be many differences between UV and LED gels, but the big difference is in the photoinitiators. Certain photoinitiators are used for UV LED gels, while the photoinitiators used for traditional UV gels are different. “UV” stands for “ultraviolet,” which is a wavelength beyond what human eyes can see. On the electro-magnetic spectrum, it’s roughly between 100 nm. and 400 nm. (The violet light you see inside your gel light is the farthest color on the light spectrum human eyes can see; human eyes can’t see the ultraviolet wavelength that’s actually curing the gel.) UV gel lamps use bulbs that are compact fluorescents (known as “CFLs” or compact fluorescent lamps). The wavelength on LED gel lights is much narrower than that of the UV/compact fluorescent lights. This ­narrow wavelength emits the right amount of the specific UV-A wavelength that’s needed to cure LED-curable gels, which is why LED-curable gels cure faster in LED lights than in UV/CFL gel lights. As most UV gels require the use of 350 nm. to cure, most UV lamps emit a wavelength ranging from roughly 320 to 400 nm. But an LED manufacturer that uses an LED gel that is rated for 375 nm. will use bulbs that emit from only 370 to 380 nm. “LED” stands for “light emitting diode,” which refers to the type of bulb an LED gel lamp uses. Jim McConnell recommends this schedule for changing the bulbs in your gel lamp: If you have 30 to 40 gel clients a week, the bulbs need to be changed every four to six months. If you have 20 gel clients a week, change your bulbs every six to eight months. Once a year is sufficient for nail techs with less than 20 gel clients a week. If you notice the inhibition layer on your clients’ nails starts getting thicker even after the correct curing time is up or if you are seeing service breakdown, this is a strong indicator you need to replace your light’s bulbs. Do UV Lamps Cause Cancer? In short, a reputable scientific study conducted by an independent lighting laboratory says no — UV lamps do not cause skin cancer. In this study, done by Lighting Science and published by Doug Schoon (CND), Paul Bryson (OPI), and Jim McConnell (Light Elegance), the results showed that the amount of UV-B to which client skin is exposed to is equal to what they could expect from spending an extra 17 to 26 seconds in sunlight each day of the two weeks in between nail appointments. One of the most common questions we get is: Is there a universal gel light that will cure all gels — UV and LED and from any manufacturer? The short answer is no. The longer answer is that there are simply too many variables you’d have to account for. Not only do the number and the placement of the bulbs in UV lamps differ (which affects the UV-A light that reaches the gel), but even how much electrictical power goes to the bulbs affects the curing power. Using one lamp for all products is risky because you run the risk of under- or over-curing. You may not even realize the gel is under-cured (it will look hard on top well before it’s actually done fully curing), so you could unknowingly be exposing the client to uncured product, which can cause adverse skin reactions. Also, the resulting enhancement will not be as durable as it would be if cured in the correct wavelength. Over-curing a gel can lead to discoloration, shrinkage, lifting, and excessive bubbles. The tool used to measure the curing power of a gel light is a spectrophotometer, but the starting price of an accurate one is about $5,000 — so at that price point, you’d be better off just buying the correct lamp for the correct gel instead. The good news is, like any new technology, gel nail lights (and the gels themselves) are improving in leaps and bounds, and the prices for the lights will continue to come down. ACTION: Apply bonder gel to the nail. BEHIND THE SCENES: Functioning like an acrylic primer, bonder gel has the ability to bond both to the nail and to other gels, making the nail plate more compatible with the enhancement product. ACTION: Cure nail in the nail light. BEHIND THE SCENES: When the photoinitiator is exposed to the proper UV light wavelength and intensity, it gives off a fragment of a molecule called a free radical. This free radical makes the gel unstable as it reacts with the double-bonds of the resin. As the double-bonds break, they combine with each other to create the polymer that we know as the gel nail enhancement (which is now back to a stable state). ACTION: (Sometimes) The client comments that her fingers feel warm or even pulls her hand out of the light due to a heat spike she feels in her fingers. BEHIND THE SCENES: The polymerization reaction gives off heat, known in scientific terms as an exothermic reaction (“exo” means to give off, and “thermic” means heat). (The warm sensation is NOT caused by “friction between the molecules,” as some say.) If the heat is so intense that it causes the client pain, then the chemical reaction has occurred too quickly. Incompatibility between the gel and the gel light can cause this problem. BEHIND THE SCENES: UV light can’t penetrate deeply into most substances, including UV gels. 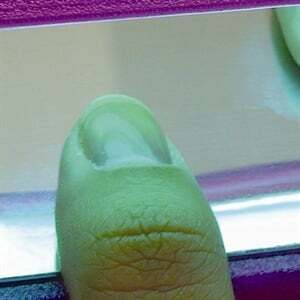 UV light is typically absorbed by the upper layers of gel or may even be reflected away. When thick layers of gel are applied, they don’t let the light get to the lower part — which means it won’t cure properly. This is why you need to apply in thin layers, curing after each. BEHIND THE SCENES: This is thin viscosity clear or colored gel that protects the enhancement from chipping or yellowing. It gives the builder gel, an inherently weaker gel, scratch- and moisture-resistance. ACTION: Notice a tacky layer on the nail. ACTION: Wipe the tacky layer with the manufacturer’s designated product. BEHIND THE SCENES: It would be possible to use other cleaning materials, but the most effective are isopropanol, methyl ethyl ketone, acetone, ethyl acetate, n-propyl acetate or a blend of these solvents. Water is not recommended because it won’t remove the uncured gel. Be careful not to touch this uncured gel (i.e., don’t file it off, then rest your arm in the filings). 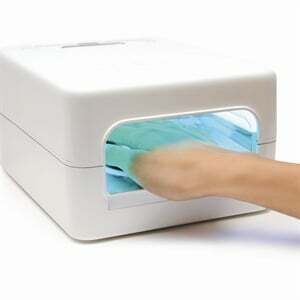 A plastic-backed pad is ideal, as the uncured gel can potentially soak through plain cotton. Special thanks to the following industry scientists for providing background information for this article: Doug Schoon, author, Nail Structure and Product Chemistry (www.dougschoon.com) and Jim McConnell, president, Light Elegance (www.lightelegance.com). Want to know the science behind other products? Learn about polish ingredients at www.nailsmag.com/polishbasics and the chemistry of acrylics at www.nailsmag.com/acrylicchemistry.